An American fleet from the ports of Portland, Boston and Gloucester would come each summer to fish for herring and mackerel in the Gulf of St. Lawrence along the north shore of Prince Edward Island. On Friday, October 3rd the winds became calm followed shortly by gale force winds. Some ships were able to escape to sea and weather out the storm while many others struggled in the huge waves that accompanied the storm that pounded the ships and weary crews for 2 days. When the winds of the fierce storm subsided the north shore of the island was awash with wreckage and the lifeless bodies of the American sailors. 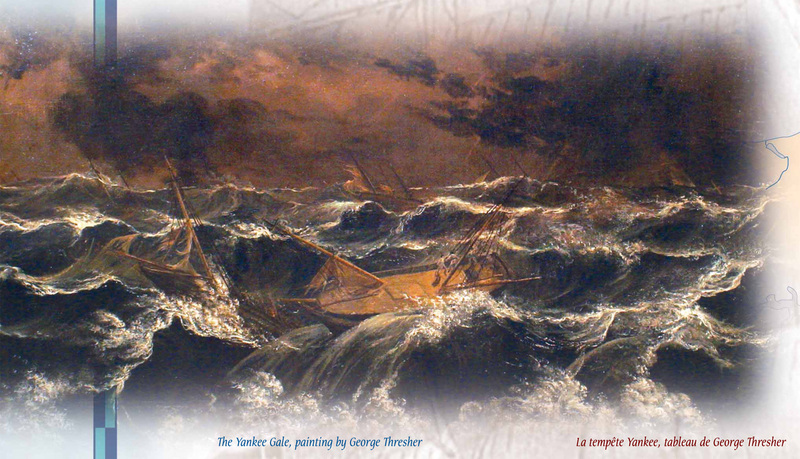 The storms toll was estimated at the time that more than 80 ships were wrecked and roughly 200 men perished in the stormy waters. The local people rescued the survivors and gathered the dead. All along the north shore of the Island, from Tignish to East Point local cemeteries, including Cavendish (a single anchor makes the graves), became the final resting place for many of these sailors.